As we go into October, America begins to shift. Halloween decorations pop up here and there. Scarecrows and witches appear in equal measures. Turkeys fat, round, and made of crepe paper rule over their dominion of seasoned breadcrumbs at grocery stores. In a sudden shift, almost overnight, after the blackest of Fridays, Christmas trees sprout from unwitting places weighed down with sparkling ornaments. Santas, their beards white and curled laugh merrily at passersby, ringing bells. If you look very closely sometimes you can see blue and silver– a menorah half-hidden behind a display of red and green stockings. I find holidays fascinating. For a little while every year I step away from myself, deeply entrenched in Midwestern Americana, to look at it all as an impassive observer. To see that butter turkey with eyes that have never seen one before. To see that tree dragged in from the cold and shaken of any wayward needles only to be dressed in finery. To see the skeleton who sits in a rocking chair beside me, a pointed hat sitting atop her head at a jaunty angle. It’s odd. It really is. Our years are punctuated with celebrations. Holidays. Memorials. Anniversaries. Some looking to the future. Some looking to the past. Some in celebration. Some in solace. It’s a global phenomenon. A bit ago I went to The Feast of the Hunter’s Moon at Fort Ouiatenon. It’s an annual recreation of a gathering of the French and Indigenous Americans during the mid 1700s. While there, as per usual, I did a lot of thinking about how this will inevitably find its way into a story somewhere: the smell of gunpowder, the multitude of uniforms, the intricacies of lace making. (In related news, I learned that my aptitude for guessing military uniforms is mostly based on Age of Empires and Assassin’s Creed.) All that, though, is what they were performing. What about the performance itself? This year marked the 49th anniversary of this event. It’s gone on for years. People getting together and marking time with this celebration. It feels like sometimes fantasy novels are stagnant in a bizarre lack of history. Nothing has changed and nothing will, until maybe our chosen protagonists have something to say about it. If there are monarchies, then the same families have been in control since the very dawn of the kingdom. If there is a monotheistic religion, then that singular deity has never been worshiped in any other way. Perhaps there was once a great upheaval, but the ripples of it have long been forgotten. There is a lot forgotten in fantasy. History and holidays are linked. It’s memory. A cultural memory of how celebrations occur and why they do. There are ceremonies for birth and death. Holidays for abundance and good will. For the turning of seasons. The cyclical cycle of the planet that no one can ignore really. One of my books starts with a festival. I did this for two reasons. Reason number one: to enact that old fantasy novel standby of beginning at a fair, or a harvest festival, or a autumnal thing that is never really said what it is for but there are squashes and merriment. Reason number two: to see the same event celebrated two ways. To see the celebration of those who won a battle and the memorial of those who lost. Not heroes or villains. Just opposing forces. The same event was the catalyst for both holidays, but the way both nations celebrate it draws a decisive line between them, for good or ill. When we build our new worlds, when we write them into existence, we aren’t beginning at year one. We don’t, for the most part, begin with the big bang. We are stepping into the middle of something. Something that comes with its traditions and holidays and history all linked together in a messy, tangled web. They celebrate their gods and goddesses. They mark death and life. They know what their traditions are, even if we don’t yet. It might not be the first anniversary of something, but the 12th or 87th or 119th. There is a richness to holidays and the everyday intersection they have with life. As you build your world, consider what they would think is worth remembering. What swirls around them, vivid and full of life and memory? A world doesn’t happen in a void. A not so snazzy title there, but to the point. Ok. So, I should really start this by saying I am an analog sort of person. If I can do it with paper, pen, and no tech… that’s usually my inclination. To date I still don’t have a Twitter, I think I Facebook about at the same rate as blue moons, and what even is an Instagram? I’m a terrible millennial. 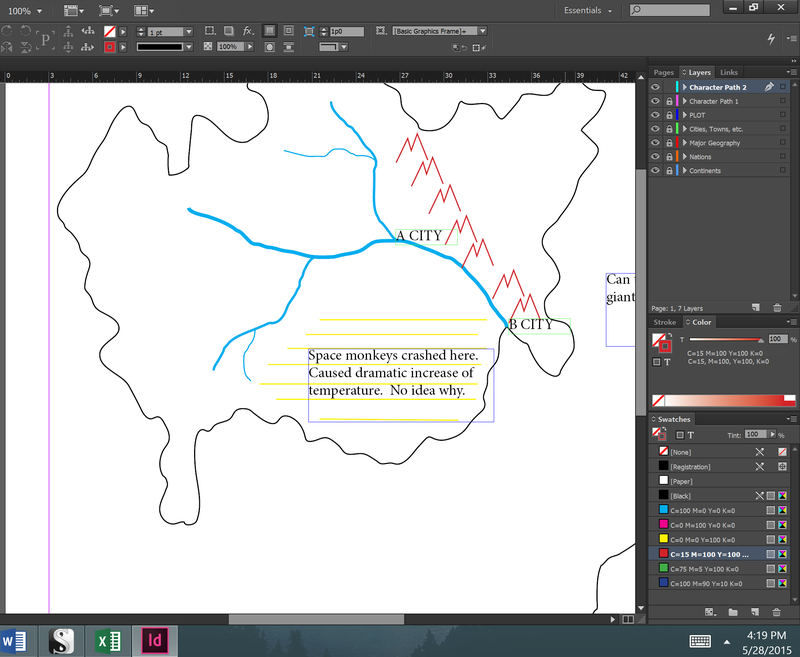 However, recently InDesign has completely won me over in keeping my maps up to date. As has Scrivener, but that is inevitably another post. My initial maps are basically wobbly penciled in shapes I threw on a piece of paper to get me started. If I am feeling really fancy, I might throw in a river and mountain range early on. But I tend to fill in as I write the story, rather than coming up with a mostly realized geography right off the bat. Which means I have about a billion various versions floating around my desk in a sort of miasma of geographical thought. It’s a bit uncontrollable. Once I really get into a story I break out the post-it notes. Which means my now giant piece of paper is covered in tiny cramped notes about terrain, history, and plot. This also means everything about my world is literally one wayward breeze from falling off. Not even taking the cats that I live with who see sketched on paper as luxurious beds into account, this is a terrible plan. Since I don’t think words will be enough here, let’s make a map together! 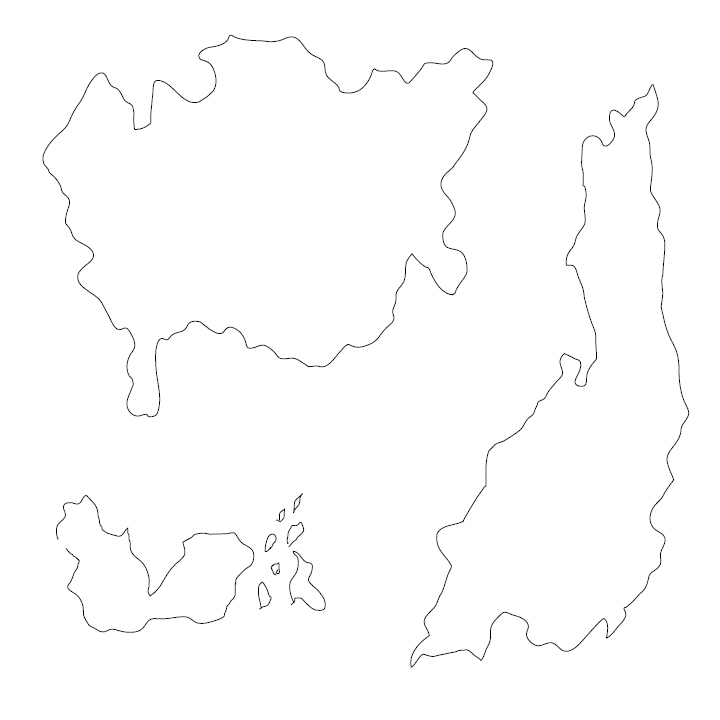 First step: Continents, or islands, or whatever land mass you are using! Personally, I love being able to draw them on a touchscreen, but mouse or trackpad work just as well. Draw as many amorphous blobs as you like. MAKE A NEW LAYER. Lock your continents so you’re not moving your blobs around. Now, I like to give myself some defining features. Feel free to use whatever iconography you like for these. 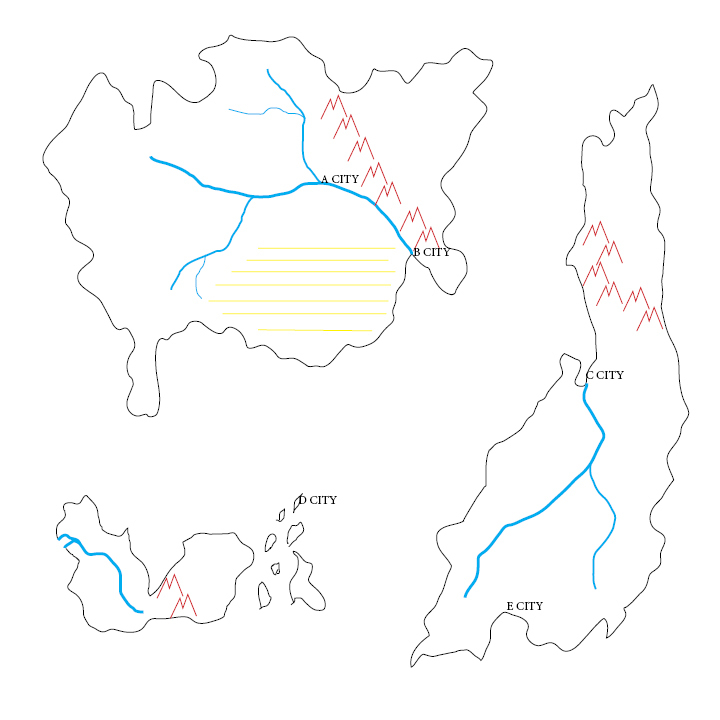 Where would rivers be? What sort of mountain ranges are there? Any major lakes? Deserts? These questions help define where cities and towns would appear. 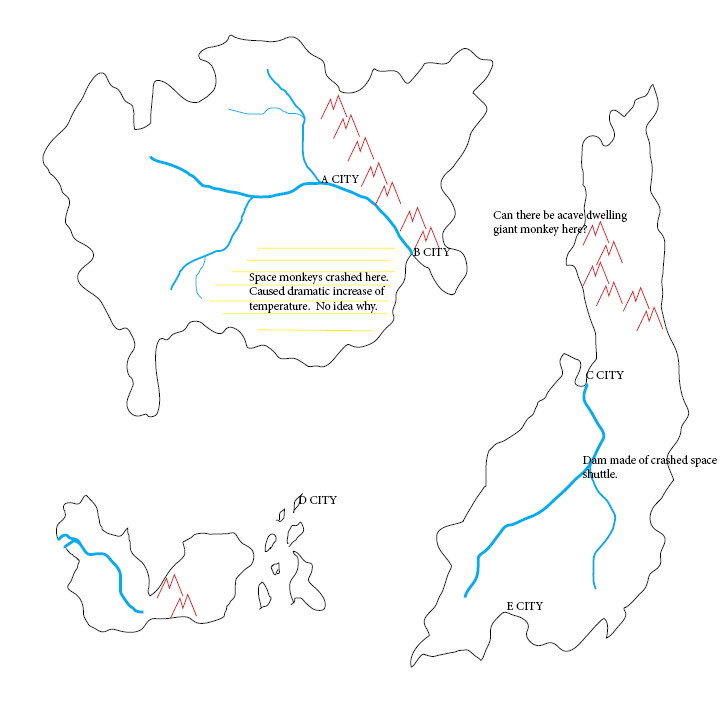 A port city at the mouth of a river will help with trade. Mountains might define country borders. Culture is affected by geography. Once you have an acceptable layer of geography, lock that layer. You can always come back to add a swamp, cave system, volcano, etc. MAKE A NEW LAYER. I CANNOT STRESS THIS ENOUGH. Being able to move towns around while not accidentally moving an entire mountain range is basically priceless. Next, I like to sketch in any cities or boundary lines I have in mind already. There we are. Although it’s not pretty and far from perfect, have a slightly more functional map system for some of your writerly needs. Side note: My cats disapprove of the lack of paper now strewn across my desk. Anger your cats at you own peril. I’m not responsible for that.